In the winter time I am constantly looking for an excuse to make chili beans. With the Super Bowl coming up I figured it was the perfect time to make a crock pot of sausage and beef chili beans with the Carroll Shelby’s Chili Kit (which I LUHUHUHV!). Since I called this go around a test run and promised to make it again on Super Bowl Sunday the hubs and Miss Maddy were okay with that. 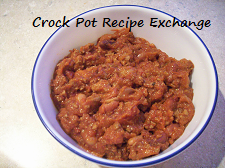 They’re a little accustomed (or spoiled… just sayin’) to having these crock pot chili beans on Super Bowl Sunday. 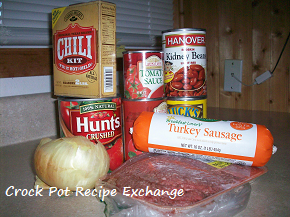 In a 5 – 6 quart crock pot add the sausage, ground chuck, onion, crushed tomatoes, stewed tomatoes, tomato sauce and the packet of large seasonings from the chili kit. Cover and cook on low 7 – 9 hours or on high for 3 – 4 hours. The last hour of cooking add the canned beans, just to heat them through. There will be 3 more packets in the chili kit. Salt, masa and chili powder. Before adding beans taste the chili and see if it needs any more seasoning from the salt or more heat with the additional package of chili powder. Add as needed. If the chili is to thin for your liking, sprinkle some (or all) of the package of the masa over top of the chili and stir in to incorporate. This will thicken it within a few minutes of adding. 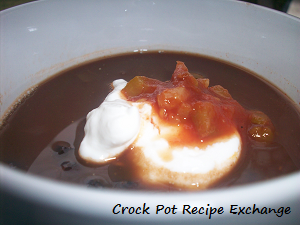 If the chili is too thick for your liking, add additional tomato sauce, chicken or beef stock or even water. I would start with a 1/4 cup at a time until the consistency you desire is reached. ﻿Serve topped with cheese, sour cream, salsa, chopped green onions and tortilla chips. 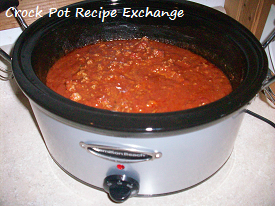 See Thick, Thick Crock Pot Chili with Beans on Key Ingredient.